The Apple TV is a neat device that turns any TV into a Smart TV and you've come to the right place if you're looking for the cheapest Apple TV prices, including all the latest information on how to buy the new Apple TV 4K. You'll be able to stream online content from major apps like Netflix and iPlayer, and there's a huge wealth of App store and iTunes content to enjoy on the big screen too. For the older Apple TV units, there is no native app for Amazon Instant Video though. Thankfully, Apple and Amazon have called a truce for the upcoming Apple TV 4K, which will finally see the Netflix rival join Apple TV. The latest Apple TV 4K is available now from $179/£179. The fourth generation Apple TV (aka the 2015 model) usually costs around $149/£139 for the 32GB version, so you shouldn't pay any more. We'll run through the best deals for the 3rd and 4th generation models too. The outdated older-gen models have been discontinued, so we haven't included them in the roundup. Apple is remarkably slow to the 4K streaming race and hasn't done itself any favours by coming in with the most expensive price compared to the Amazon Fire TV, or the best Roku deals and Chromecast Ultra prices. If anyone has the Apple TV on sale though, we'll be there to catch the cheapest prices and deals. Talk about being late to the party! Fans of all things Apple have been waiting for a Ultra HD Apple TV 4K for a few years now while the likes of Amazon, Roku and Google have all beaten the Cupertino firm to the punch. Apple TV 4K is finally available to buy though. The Apple TV 4K has some catching up to do, but will come with 4K and HDR (High Dynamic Range) support. The inclusion of Amazon Instant Video support means this could become your new all-in-one device if you're already settled into the Apple ecosystem. It can go one better than the competition too thanks to Dolby Vision support, not that there's a huge amount of DV content yet. Apple TV 4K prices start at $179, £179, AU$249 for the 32GB version, then $199, £199, AU$279 for the 64GB model. 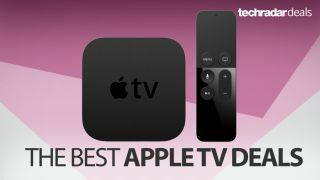 The 2015 version of Apple TV is on sale now and was seen as the best yet in the series before the Apple TV 4K came along. An updated remote control with a touchpad and a Siri-friendly microphone will make iPhone users feel right at home. There are 32GB and 64GB models available. The 32GB Apple TV should be enough for most users, especially if you're mainly going to stream media. You can save a lot of money if you're willing to opt for the older third generation Apple TV. This was the first Apple TV to feature 1080p, so you're still set for full HD loveliness. The remote control is a bit dated compared to the new Siri-friendly one on the 4th gen machine, but you still have the option of using the AirPlay app on an iPad/iPhone instead. There's no on-board storage, so this model is strictly for streaming only. This version has an optional optical out audio connection - a feature cut from the 2015 model for some reason. Check out the popular Roku deals for even more streaming boxes.